While were at a birthday party at the park last week a friend handed me a bottle of sunscreen and asked me to look it over to see if it was something I recommended. This is a sunscreen I have recommended in the past, although since then I have developed more specific criteria for my sunscreen analysis and I thought I’d walk you through my thought process in evaluating this and all sunscreens! The sunscreen she was using was Neutrogena’s Pure and Free Baby. The first thing I look for are the words broad spectrum, as this label shows. Broad spectrum means the sunscreen protects from both UVA and UVB rays. SPF only measures how a sunscreen protects the skin from UVB rays. I aim for SPF of 30-50. Anything higher can cause a false sense of security while you are getting no extra protection. It feels like false advertising to me and makes me question the product reliability. In fact, European and Australian sunscreen claims are capped at SPF 50! 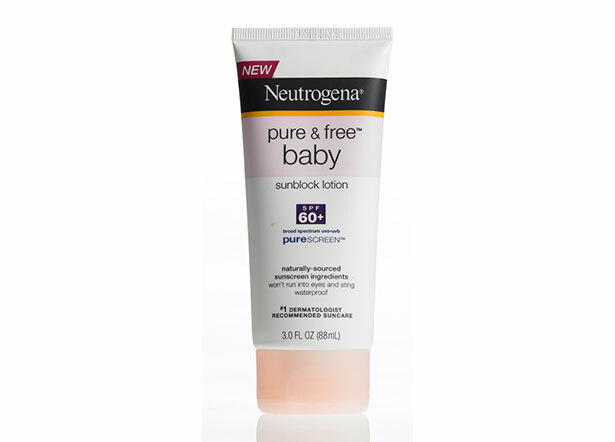 Neutrogena Pure and Free Baby isn’t too outrageous with their SPF 60 rating. This alone would not keep me from buying the bottle. I always avoid the sunscreens my children and other parents love, sprays. I don’t do it to ruin your fun, I promise. I explain why I avoid sunscreen sprays in my first FAQ post. Neutrogena Pure and Free Baby is a lotion so it passes this step! Another things to avoid when you are evaluating a sunscreen is the active ingredient oxybenzone. Oxybenzone is a potential hormone disruptor. I have also read it described as a synthetic estrogen. If you are interested in researching more about this, there is a plethora of information available with a simple Google search. I choose to avoid oxybenzone with my children because I fear hurrying puberty along! * Neutrogena Pure and Free Baby passes this test since it’s only active ingredients are zinc oxide and titanium dioxide. The last thing I avoid in sunscreens is the inactive ingredient Retinyl Palmitate or Vitamin A. Vitamin A is a fabulous anti-aging ingredient but studies have shown that when it is used on sun exposed skin, it can cause skin tumors or lesions to grow MORE QUICKLY! Eek! Save the Vitamin A for night creams and avoid it in sunscreen! This is a pain to check for in sunscreens! It is often close to the bottom of the inactive ingredient list and in tiny print! I found this ingredient in too many sunscreens I checked a few weeks ago at my local CVS. It was VERY frustrating! I also noticed that different SPF levels by the same brand’s inclusion of Retinyl Palmitate varied, so it is worth checking each formulation if you prefer a certain brand. Neutrogena Pure and Free Baby does NOT pass this test. Why on earth they have an anti-aging ingredient that can speed up cancer growth in their sunscreen is beyond me. But, because of it this sunscreen has FAILED the Martha check. 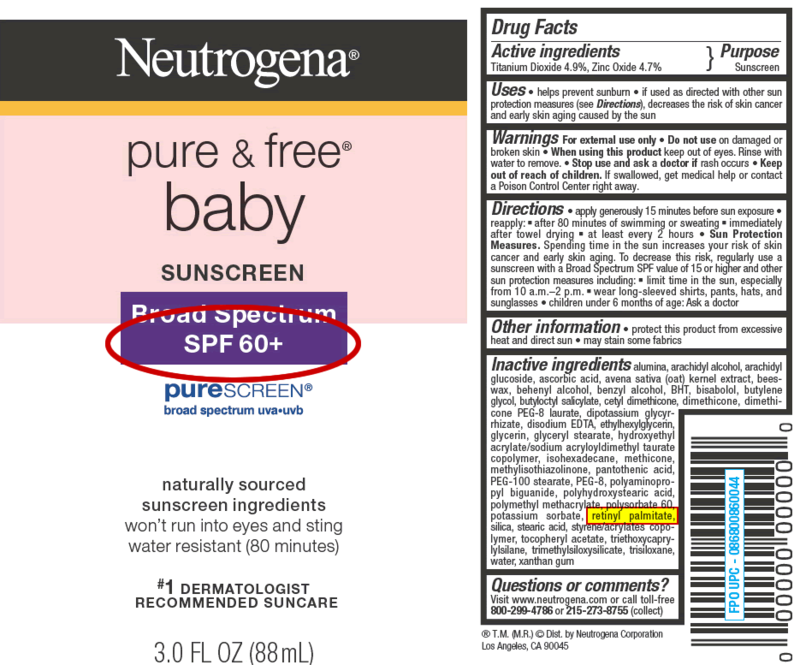 As if to prove my point about formulations, when I went on Neutrogena’s website to link to their sunscreen, I looked at Neutrogena Pure and Free Baby Faces Ultra Gentle‘s formulation and with SPF 45 AND no retinyl palmitate in the ingredient list, it DOES pass the Martha check! The Pure and Free Stick seems to check out as well. So, there is a good alternative to the Pure and Free Baby we ruled out tonight. Often the “faces” formulations are more expensive, so hopefully Neutrogena will change their formulation of the Pure and Free Baby soon! Hope this helps as you tackle the many choices of sunscreens available! *I must confess that my beloved Blue Lizard contains Oxybenzone. We are trying out a new sunscreen now to avoid the ingredient, but we had made a decision that as high risk as our children are for developing Melanoma, it was worth the exposure to the ingredient. Especially since Blue Lizard is known for it’s staying power throughout the school day. The Sensitive and Baby formulations of Blue Lizard ARE oxybenzone free, however! Martha…thank you, thank you! I was just thinking about this exact question over the weekend. And I thought to myself I need to ask Martga what her ingredient preferences are. There are so many big words that it is overwhelming. I want to get the best for my family but the cost of the lizard is getting expensive. So i too have been looking at other alternatives that are just as good for us. By the way, I’m not a fan if the sprays. I’ve never felt like they do a good job and you still have to rub it in to get coverage, plus the chemicals and mess. Lotions make it easy to apply inside and dont maje a residual mess. Thank you for educating us! You’re the best! You’re welcome! Sunscreen is expensive! Especially right now with the frequent reapplication. We bought a large bottle of Supergoop from Amazon. It was $43 for 18oz. NOT cheap, but a little cheaper than Blue Lizard and a little seems to go a long way! It also meets the Martha check! Just looked at Supergoop on amazon and love the pumper idea for the kids bathroom. Just ordered it. Thanks again! Just had a sunscreen situation with my sister in law saying how much she loves the spray on sunscreen but it seemed like the kids still got too much sun.. I gave her your facts and set her straight! This was so helpful Martha! I have been trying to convince my husband to stop buying and using the spray sunscreens and think if her reads your blog he will be convinced. I might be heading to CVS tomorrow for their baby sunscreen. Martha, I was just gonna ask you about the article in the Daily Star today and here was your blog. Thank you! I keep learning so much from you and your journey with melanoma. Neal as had basal cell and squamous cell because of those years on the deck of a Navy ship and no sunscreen. He is checked every 6 months now that it has escalated a bit but I am much more vigilant now too, though very ignorant believing all sunscreens to be created roughly equal. Thank you! Martha, do you have recommendations for a daily moisturizer with UV protection? I would do better about wearing sunscreen on my face/neck/arms if it was something that actually rubbed in and didn’t look so “white”. We use a good sunscreen for pool and outside in the sun time, but I need a good moisturizer that’s “safe” and effective, rubs in well and doesn’t feel like cake on your skin. I have two for you to try. One is Elta MD which is available at Walgreens, but cheaper on Amazon and has incredible reviews. It has a tinted and regular version. I am planning to try it soon. The other is supergoop which is moisturizing and we love. It is chemically based, but doesn’t have oxybenzone. It also doesn’t have Zinc Oxide so it does not have any white tint and is moisturizing! So sorry this took so long to get back to! Thanks for the tips. I was wondering what criteria you were using to evaluate your good picks. I will be sure to put these ingredients into my phone, so that I can remember to check for them. We’re going through lots of sunscreen now that we’re in San Diego! You are so welcome! Enjoy that beautiful weather there!!! Previous PostPrevious Confirmed Responder… someone pinch me!